All I wanted was a simple vacation from the ordinary frustrations of life, what I got was a few years of trying to recover American (MIA/POW) Missing in Action remains from Vietnam. …and a book. 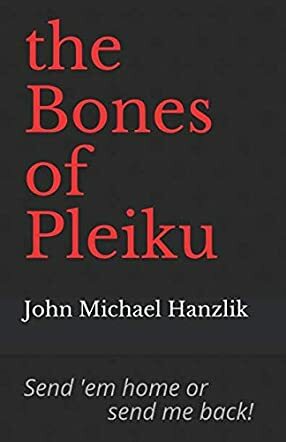 The Bones of Pleiku: Send ‘em home or send me back is a real life memoir as recalled by author John Michael Hanzlik. As the author is a veteran of the Vietnam war, this semi-historical account actually takes place mostly in the nineties when John returns with his wife to visit her family in Vietnam. Though some tales hark back to what it was like to actually live in the country beset by war, most of the action is focused on John’s mission to retrieve some Missing In Action remains from the war days. It’s these objects which spark heartfelt stories and interesting new perspectives on the war that saw so many people die needlessly on both sides. The individual tales recalled, chapter by chapter, by author John Michael Hanzlik reveal a compassionate but also brutal depiction of what survival and reflection on war can be. Though some tales are told with humour and light, others create harrowing images of the reality of war, and the difficulties of cross-cultural relations, both on a personal and political scale. It is clear that Hanzlik has witnessed and experienced a lot. His perspective on the world then versus the developing modern struggles provides some really interesting insight into the human condition and its capacity not just for destruction, but for rebuilding and promoting how life goes on after trauma. I would definitely recommend The Bones of Pleiku as an inspirational, educational and eye-opening work to bring the history of wartime and post-war Vietnam to a new audience.